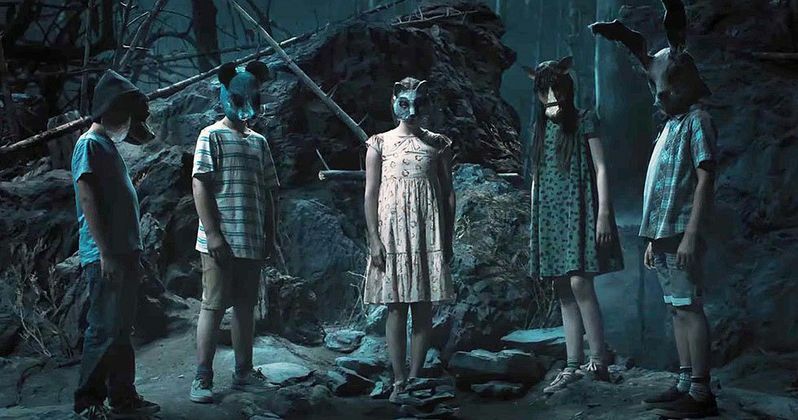 Pet Sematary is a solid remake of Stephen King's horror classic. Fans of the novel and Mary Lambert's eighties version will be surprised by the changes. New audiences will get a shiver down their spine from the wickedly atmospheric chills. It's a win-win for the beloved story. Directors Kevin Kölsch and Dennis Widmyer crank up the creepiness with skillful filmmaking techniques. Their expertise adds sizzle to standard horror tropes that would otherwise be banal. The film begins with the Creed family moving to the picturesque town of Ludlow, Maine. Louis (Jason Clarke) is a doctor looking to escape the bustle of Boston. His wife, Rachel (Amy Seimetz), suffers anxiety attacks from a traumatic childhood experience. They have two children, a sweet nine-year-old girl, Ellie (Jeté Laurence), and toddler son, Gage (Hugo Lavoie, Lucas Lavoie). Rounding out the Creed clan is Ellie's fluffy, long-haired cat Church. Life in the country is not what they expected. The house sits on a rural road with heavy trucks barrelling through. Even more disconcerting is an odd procession witnessed by Ellie and Rachel. The locals bury their pets in a graveyard behind the house. The thick forest and misty ground are made more ominous by a bramble barrier to the deeper woods. When poor Church is killed on the road, their neighbor Jud (John Lithgow) offers Louis an alternative to breaking Ellie's heart. The ground beyond the barrier reanimates the dead. But when the animals come back, they are different. Pet Sematary is a well made film. Kevin Kölsch and Dennis Widmyer (Starry Eyes, Holidays) keenly understand the fundamental roots of fear. They don't just lead you to a scare. The setting is bathed in darkness and dread from the opening frame. They stoke uneasiness, slowly building tension, then strike unexpectedly. They nail a few jump out of your seat moments. The cumulative effect makes the obvious scares more unnerving. Kölsch and Widmyer elevate Pet Sematary beyond the script. They have talent in the genre and were an excellent choice to direct by the studio. The female leads outshine their co-stars. Amy Seimetz and Jeté Laurence carry Pet Sematary with convincing performances. The subplot of Rachel's youth establishes an emotional foundation for the character. Her terror in facing death is realistic and believable. Young Jeté Laurence goes from sweet to sinister flawlessly. She has a lot to do in the film. Laurence pulls off every scene. One in particular had the gal sitting in front of me petrified. The kid gets downright scary. Kölsch and Widmyer again deserve credit. They had confidence in her abilities and it shows on screen. I won't delve further into the differences between the book and previous film adaptation. Each version has their strengths and weaknesses. Pet Sematary is a known commodity. This remake makes a few bold choices. Thankfully the changes succeed without losing sight of the premise. It's not entirely predictable. That should be appreciated by every horror fan. Paramount Pictures will put a fright into the weekend box office.